A weekly newspaper has turned its masthead pink for the first time in its 132-year history. The move by the Sevenoaks Chronicle ties in with the town’s Pink Week campaign which aims to raise awareness and funds to support those affected by breast cancer. A donation of 5p will be made to Breast Cancer Care for every copy of the paper sold. The masthead colour change reflects widespread public support for Sevenoaks Pink Week, which has involved a street party attended by 3,500 people, mass community fundraising and, on Saturday, a visit from Chris Evans’ pink Lady Penelope Fab 1 Rolls Royce. “Pink Week may be a national campaign but it’s been taken to heart in Sevenoaks like nowhere else in the country,” said Chronicle editor Gabriel Shepard. “All across the town businesses have been inspired to get involved, with the majority of shops exhibiting vibrant window displays. “The Chronicle team also felt compelled to get into the spirit of things and decided the best way of doing so would be to pink-up our own ‘shop window’ – the front page – while making a donation to the cause for every copy sold. As well as covering the town’s fundraising efforts, this week’s edition of the paper features an exclusive interview with best-selling author Martina Cole about her own involvement with Pink Week, an emotive report on a local resident’s battle with the disease and breast cancer awareness advice. 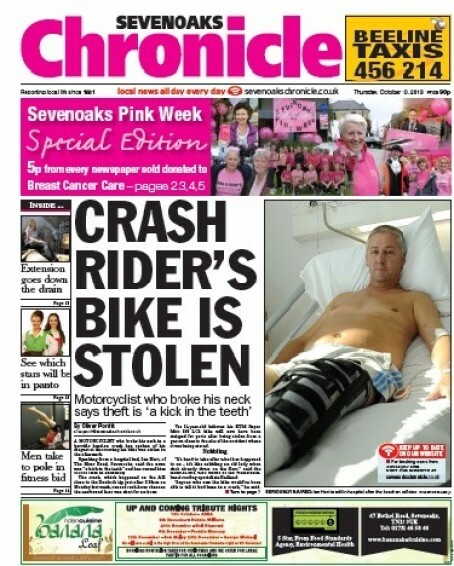 Pink news bills have also hit the streets of Sevenoaks this morning to promote the coverage. Andy Harris, Breast Cancer Care’s director of fundraising and marketing, praised local fundraiser Steph Harrison who has been the catalyst behind this year’s campaign. “We’re thrilled to hear that the Sevenoaks Chronicle is getting so involved in Sevenoaks Pink Week with Steph Harrison,” he said. “It’s a really exciting event and we’re so grateful for Steph’s hard work and dedication, as well as the support from companies and publications like the Sevenoaks Chronicle. 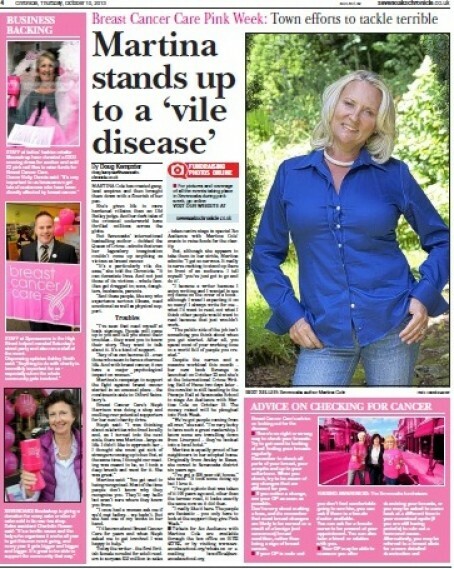 As the organiser of Pink Week I am so happy that you have picked-up on this story as it all helps with awareness. Thank you for spreading the word of the work we try to do in Sevenoaks to help Breast Cancer Care.